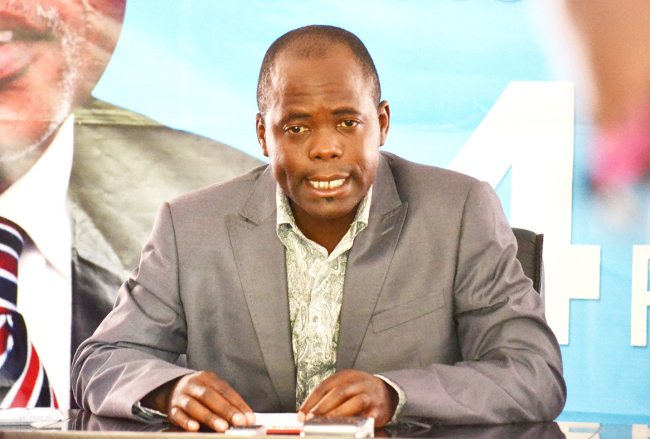 Mutati faction MMD Chairperson of Energy Mr. Tobias Kafumukache says UPND Chilanga Member of Parliament Keith Mukata should be commended for his stance to defend democracy and disobey UPND dictatorial propaganda by the UPND leadership. Mr Kafumukache said Mr Mukata should be commended for his bravery act and standing up to cheap dictatorial tactics of UPND leader Hakainde Hichilema. He said Mr Mukata being a Graduate of Democracy from the MMD School of Politic showed that he clearly knows that it is the Great People of Chilanga who elected him to Parliament and not the UPND leader. Mr. Kafumukache further said as opposed to cheap politicking the People of Chilanga are in a hurry for development hence he obeying by walking out of Parliament would have been an insult to them because he reports to his voters and not Mr Hichilema. On Sunday the UPND President said Mr Mukata’s actions did not represent the interest of the people who voted for him in Chilanga who are being detained by the PF. Mr Hichilema said Mr Mukata’s action clearly shows that he is only interested in himself and not the people, and the party adding that in due course the nation will be informed of what actions will be taken against him. Mr Mukata defied the orders by UPND President for all UPND MPs to boycott the Presidential address to Parliament a move which has since been received with mixed feelings by stakeholders . all the non entities are now commenting to get some coverage by the free media. No substance their talk. Here in India, such individual would be sent to Punjab province. How did Lungu become Zambian president. It is so confusing even to Mukata. Mukata can do what he wants, after all he was original PF minister. Why are we not being given the views of UPND? Why are we not getting views of the constituents who voted for UPND MPs. PF is reacting the way they are doing because the boycott is achieving the intended purpose. For media to abandon their call to give balanced information is dangerous. The UPND and their lawyers are extremely incompetent. UPND and their lawyers lack understanding of basic law. Now, anyone who does not understand this basic article cannot defend a case. The commencement of the case was on Friday when the petition was filed because the filing-in day was not an excluded day. Where the timeframe does not exceed 6 days, the excluded days are not counted in the computation of time. Otherwise the excluded day form part of the count – and in the case of the expired petition 14 days is clearly more than 6 days – thus all the excluded days ( weekends and holidays) were countable. @Tobias Kafumukache, note that you have joined the many betrayers in the names of Inonge Wina, Jean Kapata, Mulusa, Mukata, Mubukwanu and the Southern Province Minister whose name I have not fully mastered. You are traitors because your kith and kin in North-western, Southern and Western Provinces are being killed, fired from their jobs and you are there commending an alien government that fails even to finish the Chingola/Solwezi Road or the Kazungula/Sesheke Road. Shame on all of you. By the way, I have not hear from Enoch Kavindele since August last year when he strongly campaigned for Lungu who eventually “won” the election but has decided to construct an uneconomical railway line from Chipata through Petauke to nowhere, instead of assisting you to finish your economical railway line from Chingola to the Angolan border. Where are you EPK? @Sinono, you wildcat, we are on the same page! These traitors are being shafted for mere ngwees and their bottoms bruised while their home provinces remain undeveloped, and their relatives are being killed in cold blood. How stoopid can one get! Mukata was representing his stomach and not of the people of chilanga. ECL is an illigitimate president and the people of chilanga know that. The people represented by UPND MPs are happy with what transpired and no one is complaining except the PF who are now embarrassed and feeling the heat. We urge the MPs to continue and keep embarrasing this lunatic and dictator. His time to dance to his misdeeds will soon befall him. Mukata should resign from UPND and join PF. We are waiting for a by-election in Chilanga so that we shame PF again. If you take out that jacket, Kafumukache qualifies to be the Ugliest man in Zambia!! His mouth looks like a chimp and worse!! Ka mukata is hungry. Politics of the belly at play. Shame on this little calf. You are talking about a unza degree holder who runs a business and has wealth. Which hunger are you referring to. Just as expected, a lot of parasites cramming for media coverage will spew out from different orifices. HH should not have commented on this MP. If anything he should just have said he’ll leave it to the people of Chilanga to judge. He should use the people more after all UPND is such a big party. If the court acted with integrity this problem would have been resolved months ago. But because the court below to PF we are locked into this problem. I don’t blame UPND MPs, you do then you should also blame the courts for being inefficient. The hypocritical UPND MPs must be true to their values, if they have any. They should not be selective when attending parliament and boycott ECLs attendnace but they sould also boycott Inonge Wina as well because she is VP because ECL won the election. 1. All UPND MPs who do not recognise ECL as president must boycott all parliament sittings since the VP Inonge Wina, who is their under ECL, is always there. 2. The VP, Inonge Wina, must also refuse to recognise them as MPs and should refuse to answer their questions during The VP’s Question sessions. He must have felt out of place when those PF MPs started singing PF praise songs for Edgar..a human being should have a sense of belonging, when you lack belonging, you are a foreigner and you are treated like one..Mukata was not one of them, he was foreign..period! Mukata is a representative of the people, not the UPND or PF at this point. Once you are elected, your official capacity is for the benefit of your constituents. Everyone else that is a politician needs to keep their traps closed. We in Chilanga want Mukata to resign from UPND and join PF so that we can have a by-election. We will shame PF again and again. Mukata did not represent us when he danced and sang with PF thugs in Parliament. Mukata wormed his way to become Chilanga MP because all indications were UPND was strong on the ground and he was clever enough to know when to jump ship! Deep inside himself he had conviction that UPND would be the party in government and not PF! Fact is neither Mukata nor Moono were really Chilanga favorites but Mukata had to get it for bravery of resigning from PF! And so is Inonge …meaning every time she’s in Parliament Upnd must stay out …or is it she’s tribally related to them? This is serious …you can’t brew lager without water. You can’t say you’ll only drink water from beer. Senseless.People should know that these MPs don’t owe thier moronic president anything.What type of grade 12s are.The grade9s used to reason when doing things not these moronic empty heads.If they really mean what their Chief moron and his assistant fat alubati tell they should starting boycotting the parliamentary sittings until the petition is done with. Otherwise, their actions are nothing but the cheap way of seeking symphathy from the people they have exploiting since their party became tribal.I tell you if you want a tonga leader bring in Hachipuka and we shall all migrate.Long Live Mukata. Am just waiting to hear from these upnd mps that they have boycotted the sitting allowances then will know that their boycot is in good faith otherwise they are just foolling the people who voted for them. Am just waiting to hear from these upnd mps that they have boycotted the sitting allowances then will know that their boycot is in good faith. They are just a bunch of useless goons merely after their bellies and nothing more! Their constituencies are in shambles, come and have a look at Choma, nothing tangible! Politics in Zambia has become cheap. The mistake the Zambians made was to usher in PF government which is full of thugs. Normal Politics ended after Mwanawasa died. The MPS who are suppose to represent people in their constituencies are just there for themselves and their families. It is a shame really what is happening now. The calibre of leaders we have is chipantepante. Mwanawasa, what politics.He only cultivated hatred and institutionalized nepotism and corruption.Look at the way he drafted his friends into the justice system, leaving the experienced judges and prosecutors.He became an arresting officer, prosecutor, and judge.Hence sending the person who woke him up to be president.Atasee! The problem with United Dunderheads is that only 56 MPs boycotted and these are from 3 Provinces of Zambia. They are educated but cant see that they are bringing regionalism in the Country. The over 95 Mps who attended represent 6 provinces so who needs who in this scenario??? Mukata is zero in Chilanga right now. Let him cause a by-election and we shall meet him at the polls. PF will be ashamed in Chilanga. We are waiting for a by-election. Parliament and govt. can and will continue to function normally without these cheap tribal mps but if they have any senses, the best thing they can do is to completely stop attending parliament and continue looking after their cattle and goats because those are the ones that sent them to Manda hill according to their shallow thinking. One thing leads to another; ECL swore in Speaker Matibini, who in turn swore in the MPs! So if ECL is illegal like they put it, why then did these UPND MPs agree to be sworn in by the Speaker?? And why accept Inonge who was riding on the same Ballot with ECL? Is this not madness?? How did MMD end up with so many attention-seeking maggots? How many MPs does MMD have? This is a bunch of empty tins rattling in the wind at the smallest gust. PF Secretary General Davies Mwila has warned PF MP’s that they will be severe repercussions for voting against the party in Parliament, these will include loss of party support in future elections. Mr Mwila was speaking at the Meet the Members of parliament fundraising dinner for Lusaka Province yesterday. Mr Mwila said Zambia’s parliament is unicameral and is based on the Westminster model. Even if these upnd cohots of mps stayed away from parley up to 2021 laws will still be passed because the required number is still there. In a democracy it is always the majority that dictates the way. If Pf was in opposition and that number stayed away even for one month fresh general elections would be called. So upnd are like eff of malema who has no impact whatsoever apart from the noise and furts they contribute in parliament. “Mutati faction MMD Chairperson of Energy” kikikikikiki I had to post my comment after reading that. Lusaka Times are sketchy. Why are you complaining then? You are hurting for lack of recognition. Which constitution allows PF MPs to sing political songs in Zambian parliament? As far as the petition will not be heard UPND will never recognize Lungu as the president. Bravo UPND MPs were are behind you why wasting time listening to that empty speech by Lungu. The speaker was not in order, by allowing pf mps to sing party bostele songs in national assembly, he proved that he is pro pf. That’s PF complaining all the time. They feel slighted, insulted even. UPND strategy is working. That’s why PF cannot stop whining. Cheap politics of finger pointing and character assassination is what UPND is good at. No object, no road map. That’s why 6 times failing the election. In the university you would already have been declared untrainable. UKWALOLA UMWELA EKO BA LOLA. FDD should take advantage of UPND lack of direction and become the second popular party in Zambia. There is always an opportunity in every calamity. If Mukata was a PF MP and he defied Party Orders would the PF commend him? Mukata would have been expelled from PF by now. Mukata has embarrassed his Party,UPND and People who voted for him in Chilanga. Mukata is now a legal MP but not an MP for us in Chilanga and UPND. Should a By-Election be ca?led Mukata is a gonner. We know Mukata has been bribed by PF to do this but morally and socially Mukata has ceased to be the MP of Chilanga. Mukata is a Traitor of Note and all those who have been represented by this Treacherous and unprofessional lawyer should renounce Agency. Lungu stole a client’s money and got de-registered by LAZ. Mukata is now associating with criminal Lungu. Birds of the same feathers flock together. Time to watch out for Party members defecting to other Parties in order to get to Parliament. They pay their allegiance to those they think can give them positions. In this case Mukata might just be burying his political career because He thinks people voted for him as an individual. All the best Mukata. There might be more like you going for the dangling carrot but those with integrity remain unmoved. Whether fro PF or UPND, you will know them by their deeds. Zambains are enlightened and know who is who.